Bosanski Lonac (literal translation "Bosnian 'Pot") is an authentic Bosnian culinary speciality, appreciated for its rich taste and flexibility. It is impossible to define "the" recipe for Bosanski lonac, as there are many variations, but the main ingredients are mostly the same: meat and various vegetables. It has been on tables of both the rich and the poor for hundreds of years. Rich people used more meat and other expensive ingredients, while the poor used what was available. Typical ingredients are: beef, lamb, cabbage, potatoes, tomatoes, carrots, parsley, garlic, peppercorns (whole, not ground). Many different vegetables or meats may be used. 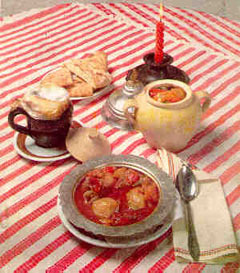 The Bosanski lonac is prepared by layering meat and vegetables (alternating layers of meat and vegetables until the pot is full) into a deep pot, then adding 1 - 2 dl water or white wine. The ingredients should be cut into large pieces rather than finely chopped or minced. Originally, Bosanski lonac was made in ceramic pots, that were then put in the fireplace or pit in the ground. That would be perfect, but today, not everyone has a fireplace available for cooking, so cooks may use a regular pot and their kitchen stove. Since the pieces of meat and vegetables are rather large, it takes about 4 hours till the meal is cooked.